· 3 Speeds: Initiation, medium and advanced. · Automatic orientation function, ideal for beginners. · Features: • 5.8Ghz. real time video transmission to the station with 4.3 LCD display • Transmitter with 4.3 full color LCD display • Auto orientation function, ideal for beginners • One Key Return • 2MP 1280 x 720P HD camera for taking photos and videos. • 3 Flight speeds: Initiation, medium and advanced. • Colorful LEDs to fly at night without losing sight of the drone. • 360º acrobatics and turns just by pressing a button on the station. • Possibility to perform inverted flights with the push of a button on the station. • Alert function when the battery level is very low. Specifications: • Flight time: 7 minutes. • Engine: Model 8520 • Video recording: 1280 x 720P • Maximum bitrate: 30 Mbps • Support SD card up to 32GB • Frequency of 2.4Ghz free of interference. • Control distance: Up to 40 meters. • Battery 3.7V 500mAh Li-Po • Battery Transmitter 3.7V 450mAh. 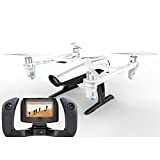 Includes: • Drone UDI • FPV 4.3 transmitter • Drone battery and transmitter • Charger • 4GB SD card and reader • Spare propellers and protectors. • Tools and manual. Rctecnic.com, drone shop with confidence guarantee, real stock in Spain.